Andy Hunt is best known as co-author of The Pragmatic Programmer and co-head of the publishing company spawned by that book. 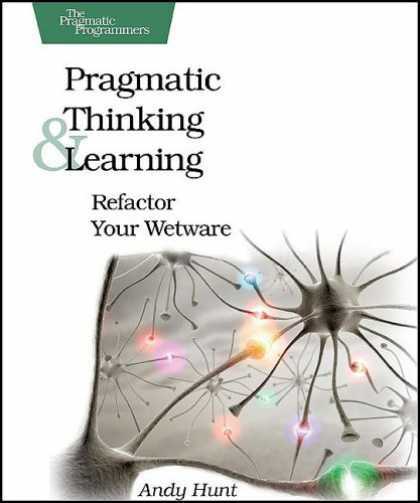 The mission of Andy’s 2008 book Pragmatic Thinking & Learning: Refactor Your Wetware is to get software professionals to engage their whole brain. I had heard about the division between left-brain and right-brain thinking, or conscious and subconscious thought, but Andy laid this division out in a new and very insightful way. He describes two modes of thinking: linear-mode, or L-mode and rich-mode, or R-mode. These two modes operate in very different ways. To unlock our full thinking power, we must learn to use the techniques Andy describes to quiet the chatter of our overused L-mode and let R-mode take over. As a novice yoga practitioner, the end-of-class meditation called savasana suddenly made sense not just as a relaxation technique, but also a way to engage R-mode thinking. Someone on Twitter recently posted “Meditation is a muscle”, and clearly this is an important one to exercise for knowledge workers. The book describes a number of techniques for improving your learning, like mind maps and SQ3R (survey, question, read, recite, review). Andy also devotes a chapter to investigating your cognitive biases, including a very interesting discussion of the theory of Generational Affinity, or why the Boomers, Gen X and the Millennials think so differently. There’s also a much-needed section on managing your focus. Doing complex software work requires an immense amount of concentration, and distractions such as Outlook email notifications, Twitter feeds, unnecessary meetings or innocuous interruptions by co-workers can totally derail productivity. Especially in busy and distracting cubicle work environments, it’s important to find a way to achieve intense concentration, but it’s also important to find the time and environment to allow your R-mode a chance to work for you. Pragmatic Thinking & Learning was a fantastic book. While I’m not sure Andy’s mind maps are really my thing, there was plenty in this book to absorb and use to further my career. I recently installed Evernote on all my computing devices to expand my exocortex and make sure I can capture ideas and thoughts wherever I am. This sort of deliberate thinking about thinking is what Pragmatic Thinking & Learning has to teach us, and I heartily recommend it even to non-technical people.